Is it hard to find? Yes! We got to 3275 Wilshire Blvd, the address Matthew gave us and all we saw was a locked door with a sign that said chocolatier on the door. A quick cell phone call to Matthew aka mattatouille (http://www.mattatouille.com) and voila Matthew emerges from a nondescript door, just 5 steps from where we are. 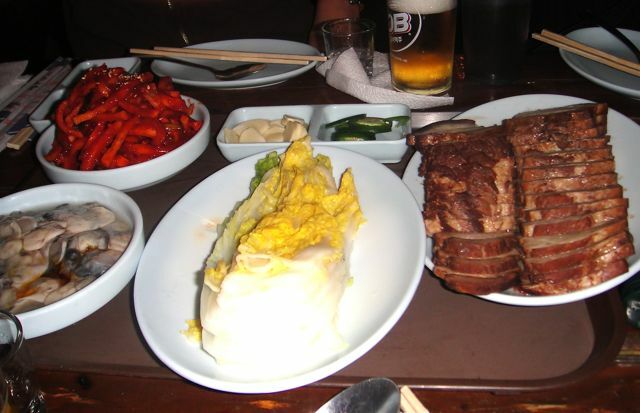 This was my first experience with Korean food and after numerous shots of Korean rice wine (Soju), beer and sneaking glasses of white and red wine “under the table”, I lost my notes. 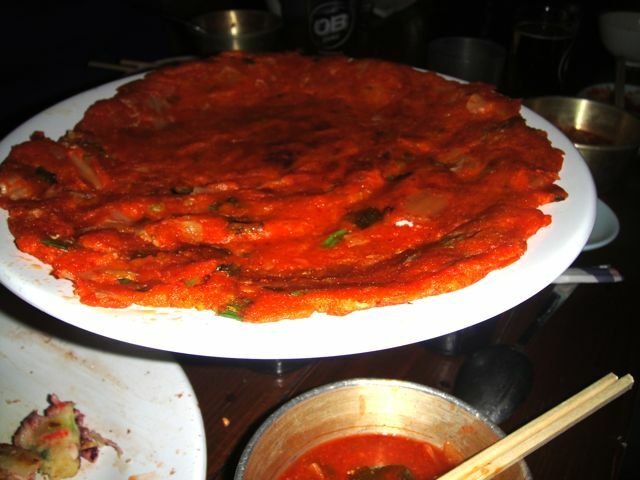 As this was my first experience with Korean food, I needed some serious help. Thanks to Matthew, this will be a complete story. There is no way I could do this without him. Trust me – he came through big time and all notes are his! A huge thank you to Matthew. 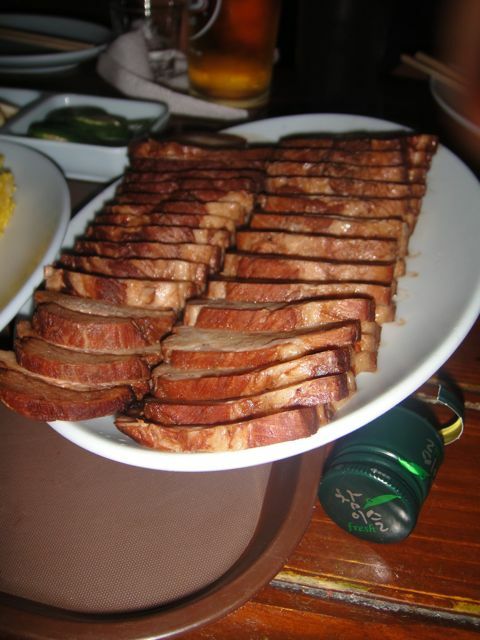 Chamisul Soju is one of the more popular brands of soju in Korea. 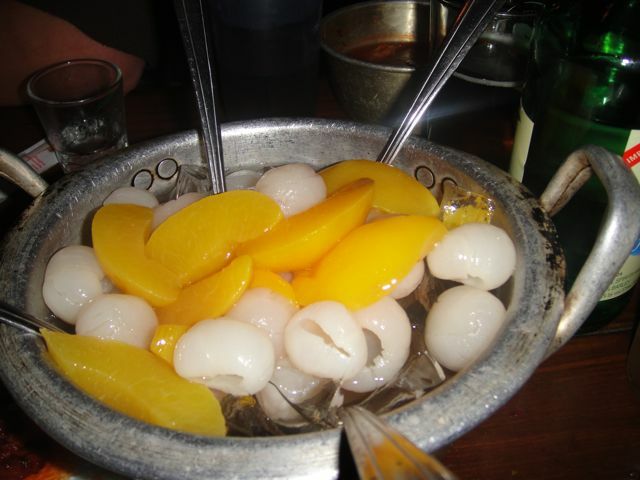 Soju is rice wine that is a bit like diluted vodka, but still refreshing with a tinge of brightness when properly chilled. My thoughts – deadly! 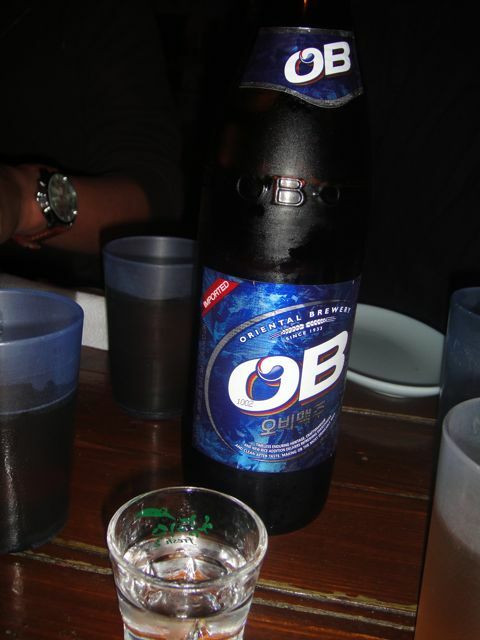 OB Beer is one of the most popular beers in Korea. 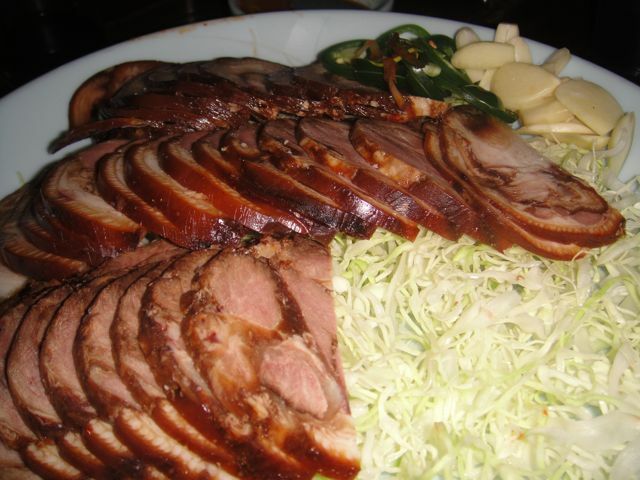 Like most Korean beers, it is a clean, crisp lager that goes well with almost any kind of Korean food. 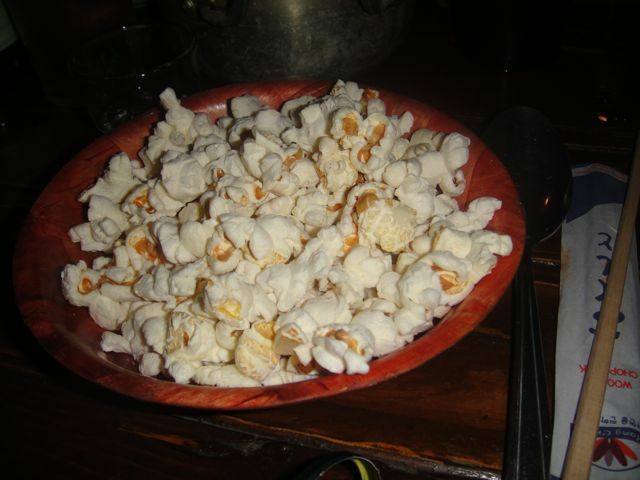 Popcorn – when you walk into a bar in Korea, you get something called “Anjou” for free. Basically these are free bar bites that you get with your drink. They are like tapas – they are meant to be eaten with drinks. 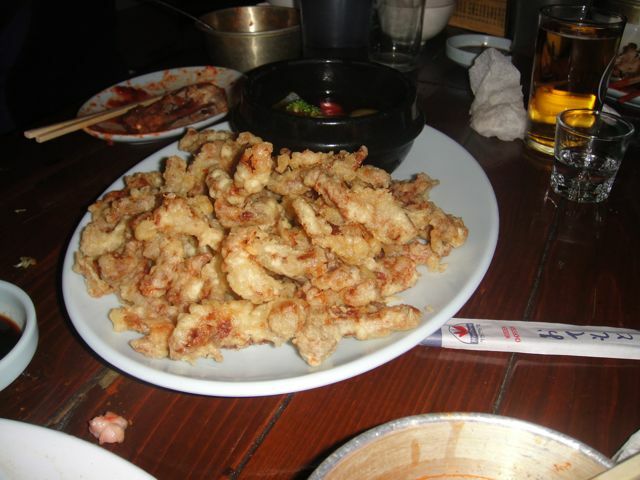 Technically everything that we had that night would be considered “anjou”, but the Anjou that they gave us was popcorn and then the spicy bean sprout soup. 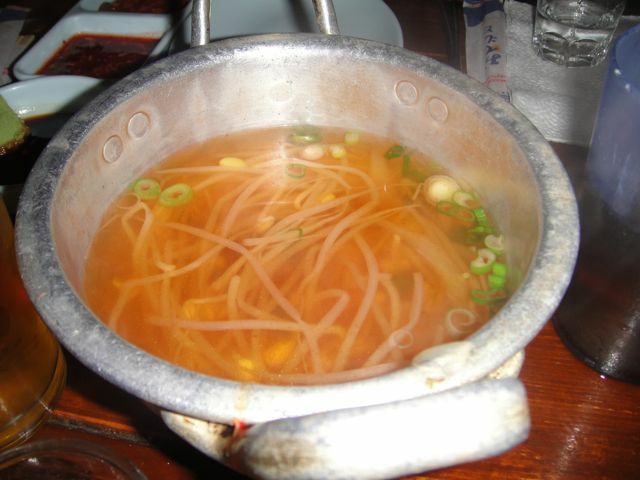 Spicy Bean Sprout soup is one of the two Anjou you can expect to get at DGM. 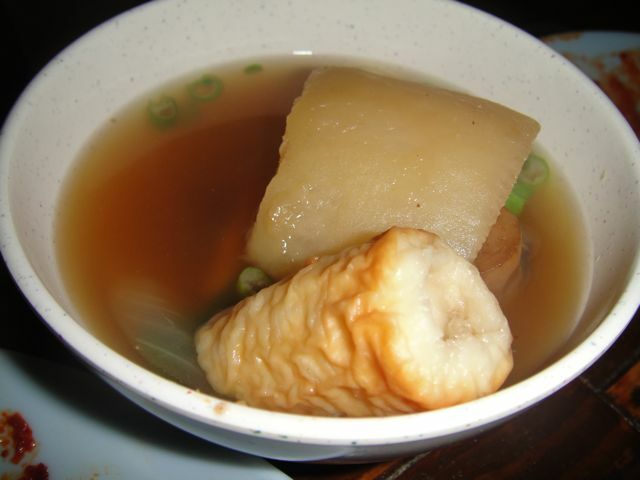 Bossam – steamed pork belly with Napa cabbage, fresh oysters, “mu saeng chae” which is spicy pickled Korean daikon radish plus garlic and jalapeno peppers – you eat this by making a roll with the cabbage as the wrapper, then an oyster, then some pork, then daikon radish, then garlic and finally the pepper. 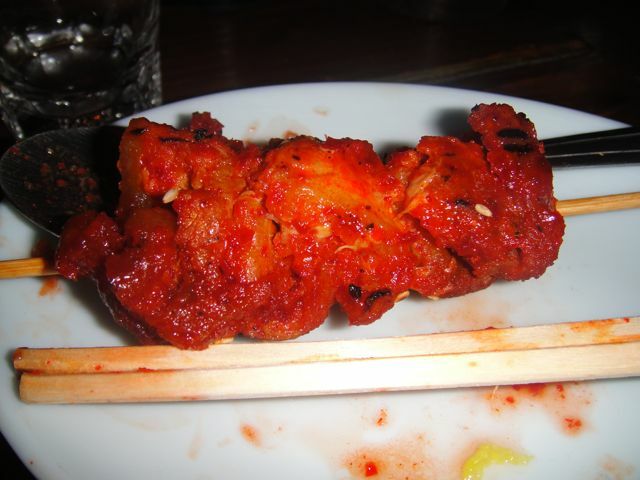 What is amazing is that the cabbage cuts the spiciness and renders this an amazing taste. 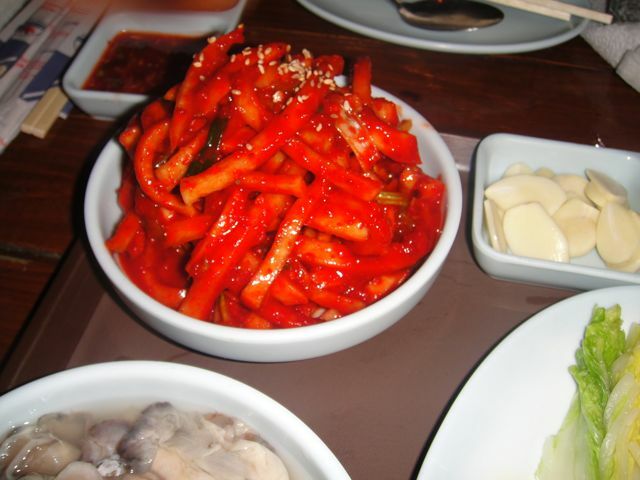 spicy pickled Korean daikon radish. 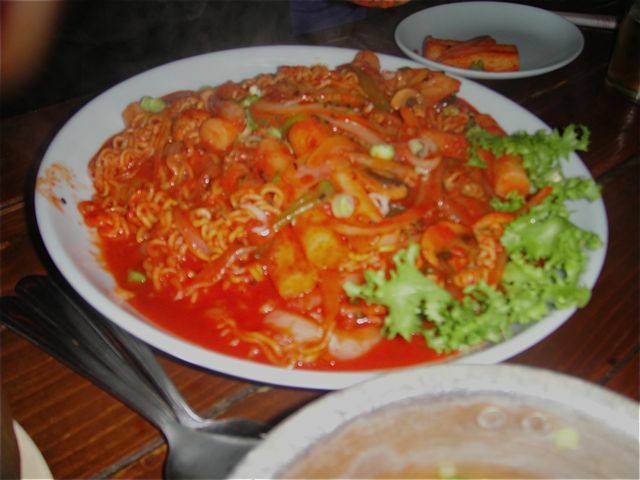 Lapoki, which is a combination of ramen noodles (Koreans pronounce it la-myun) and dukbokki (which is the spicy rice cakes dish). 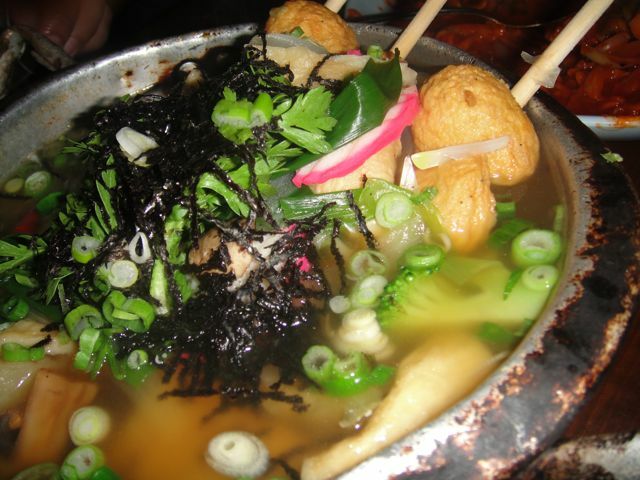 So if you combine La-Myun and Dukbokki, you get Labokki or Lapoki! 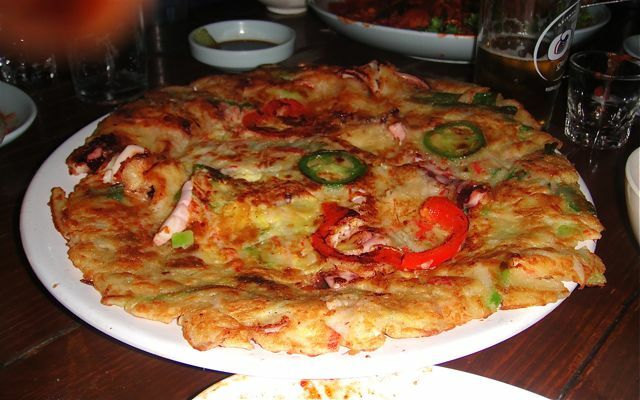 Seafood Pancake (called Haemul Pajun – Haemul means seafood and Pajun means thick pancake) There was octopus, squid, and shrimp, as well as bell peppers and jalapenos in the pancake. 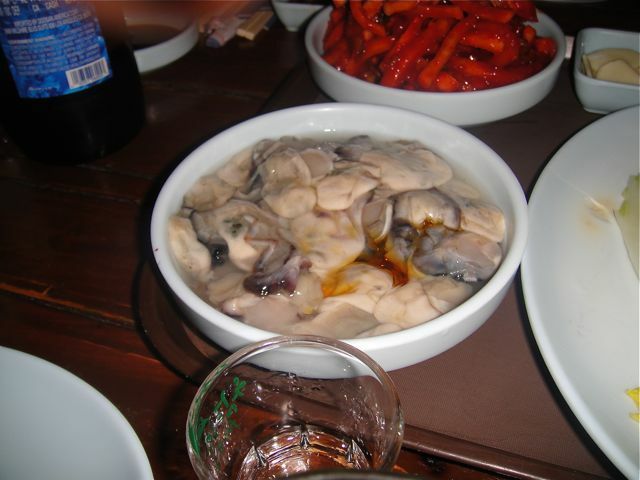 Tripe Stew or Gochang Jongol (Gopchang means tripe and Jongol means casserole or stew). 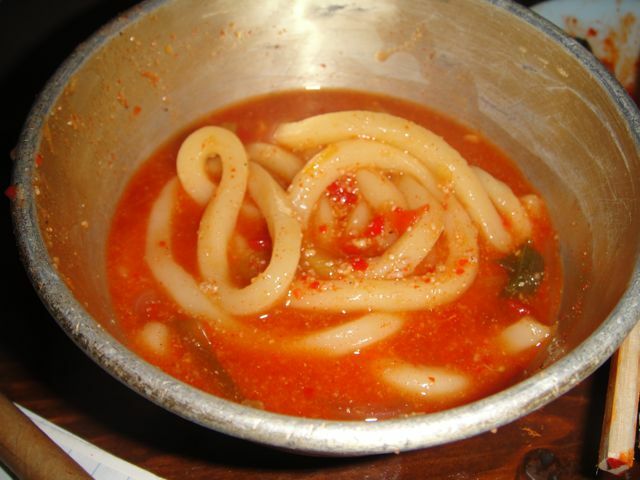 The thick white noodles are udon noodles, and the tripe stew had tender tripe while the tripe flavor pervaded the spicy broth. 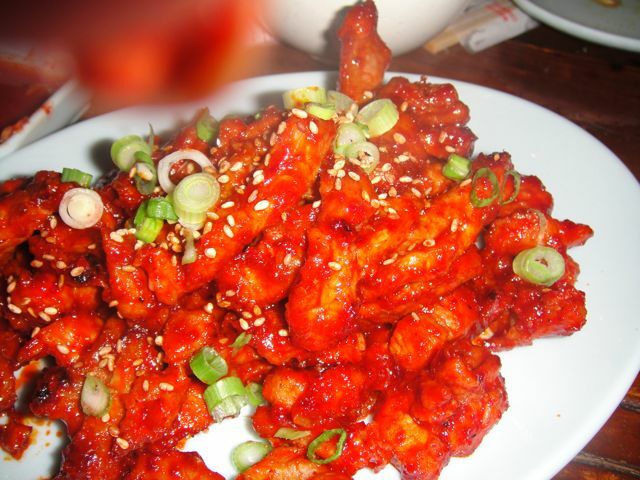 Korean fried chicken wings or “yang nyum dam nal geh” Yang Nyum means spicy sauce and dam nal geh means fried chicken wings. 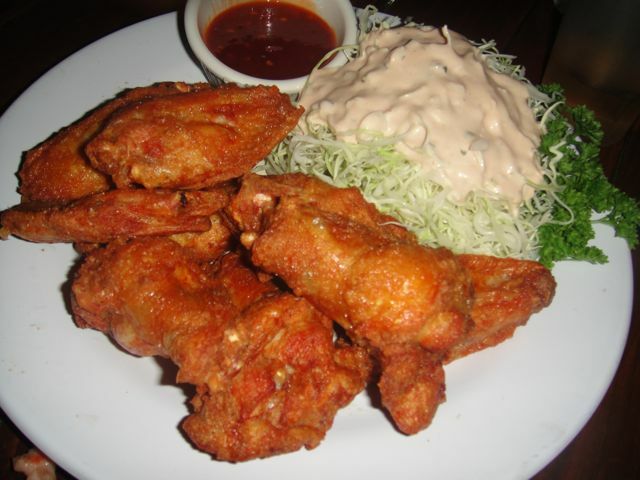 The accoutrement is shredded cabbage and thousand island dressing. What a fun evening and what an adventure with my son’s friends. 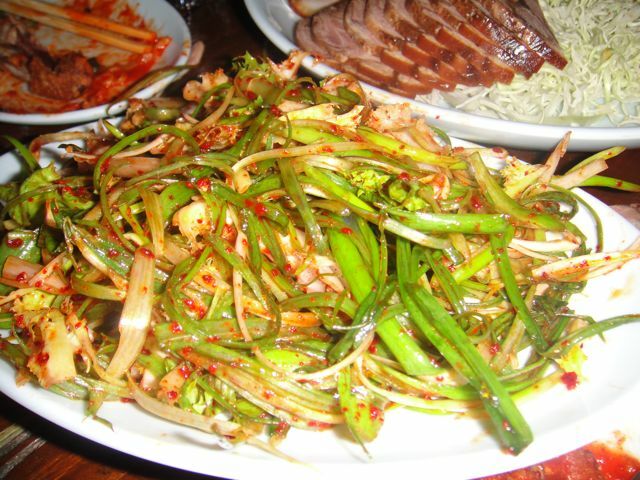 I need to explore Korean food in more detail. I can’t wait for the next adventure.